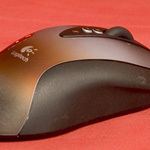 Logitech's flagship corded gaming mouse is currently the G5. While the body shape is identical to the earlier MX500 and MX518, an ergonomic full right hand shape, it has had a few buttons removed taking the total count down to 6. The wheel has been upgraded to tilt as well as scroll, meaning it protrudes a little further out of the body. The sensor is a 2000 DPI laser, with USB clocked by default to 500 Hz. The main body feels like it's actually made out of metal (although I wouldn't like to say for sure). It's got a worn look with colours fading from a rough black near at buttons to a rust brown to highlight the Logitech logo then out to silver at the base of the mouse. 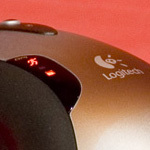 Again Logitech have stamped G5 on the back for us poor confused reviewers who have too many mice the same shape. The removed buttons are from just in front of the wheel (leaving two behind it) and one from the left side (leaving one remaining on the side). Logitech have also added a DPI display on the top-left side of the case, so you can see what setting you're currently on since it's switchable by buttons on the mouse. The G5 features a very different type of mouse cord, feeling more like a length of thin rope than a USB cable. 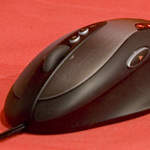 It looks very different to other mice because of the chord and the reduction in friction means that you feel it tugging less if you leave your chord laying on the table or mousepad. 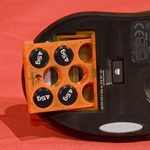 The final addition to round off this feature-packed mouse is weight cartridge on the underside, with an eject button to shoot it out when you want to make changes. The cartridge is rather neat looking with little disc weights that can be pushed into the holes before you pop the cartridge back in. Apparently changing weight is an important gaming feature. I don't really understand why, myself, but if you like to fiddle with the weight of your mouse this might be right up your street. The response of the G5 is absolutely identical to the G3, so I would imagine the hardware inside was simply copied for these two mice. 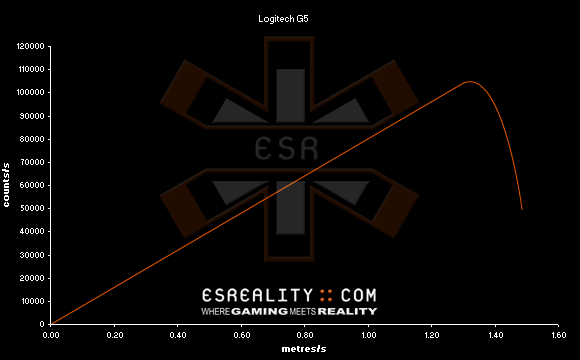 The Perfect Control range ends at 1.30 m/s (51"/s) and the Malfunction Speed is 1.35 m/s (53"/s) with resolution measured at 2000 DPI as expected. The G5 is an improvement over the G3 if you prefer some of the added features: extra buttons, tilt wheel, dpi display, weight cartridge. However the poor laser performance doesn't justify the increased price tag in my eyes. Infact it seems like madness to spend more on a G5 instead of the vastly superior MX518, unless you really, really want the weight cartridge.